An investigation in how the billionaire evangelical Christian owners of Hobby Lobby are using a vast private fortune to promote personal faith in the public sphere. Moss and Baden deftly highlight the cognitive dissonance at the heart of the evangelicalism, how and why the faithful cherry-pick Scriptures that buttress their own beliefs while dismissing contradictions among the texts themselves ... Bible Nation is a geek’s delight, seasoned with the historical skulduggery and theological debate found in a Dan Brown novel or an Indiana Jones film. Moss and Baden draw on extensive research and interviews with a revolving-door cast of so-called experts and hangers-on, leaving no proverbial stone unturned in their quest to determine the value and validity of the Green collection, the Bible Museum’s underlying purpose. Bible Nation peels away the bark on one of the largest branches of the American family tree, using an academic story to tell a broader one: the evangelicals’ unshakable conviction in their own fantasies and the demonization of anything, or anyone, that dares to challenge them. Exhaustively reported and scrupulously fair, Bible Nation doubles as a portrait of conviction: The Greens may well be the most sincere and most-frequently misguided activists in America ... The prospect of Steve Green as Bible-thumping Indiana Jones is a tantalizing vision. But in Moss and Baden’s telling, the family have long been victims of bad actors and their own incompetence. This is where Bible Nation delves deepest, revealing the extent to which the idea that some things must be verified, rather than taken by faith, contradicts the family’s beliefs. ...an essential, unsettling and often shocking account ... Although much remains shrouded in secrecy, Moss and Baden uncover many alarming details about the Greens’ acquisitions and the scholars they have paid to study them ... In the end, Moss and Baden conclude, the Greens are engaged in a project of 'subtle religious indoctrination,' carried out without 'the essential task of critical thinking.' Many non-evangelicals, perhaps sensing this, might skip the Museum of the Bible during a visit to the Mall. But because the Greens have become such powerful players on the Christian right, which finds itself unexpectedly rejuvenated by Trump, one could argue that it’s the civic duty of skeptics to go take a look — but with a copy of Bible Nation firmly in hand. 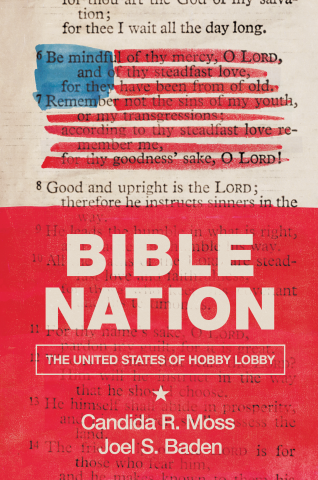 What did you think of Bible Nation: The United States of Hobby Lobby?